In this little tutorial we're going to follow a path that starts with a file on the filesystem, say a PNG file, and ends with the image being drawn to the screen using OpenGL. Even though that code simply loads and draws an image, there's actually quite a lot going on behind the scenes. The first line creates a new OpenGL texture from the result of loadImage(). This function is used for loading the various image formats Cinder knows about, and can be used to read from files, URLs, resources and other sources, as we'll see later. And the second line actually draws the gl::Texture to your window using OpenGL. These two lines highlight one of the core characteristics of Cinder's design: data, its I/O (Input/Output) and manipulation are carefully separated. Objects and functions are designed for distinct logical points in the process of loading, manipulating, and transferring data. For example, loadImage() is a standalone function, not a member of gl::Texture. Similarly, a gl::Texture doesn't draw itself - it's designed to represent image data, but not to manipulate or render it. To draw a gl::Texture, we use a standalone function as well, gl::draw(). As we explore more of Cinder's image capabilities, we'll look at some of the power and convenience this division of labor brings. The rest of this article is going to run through a few different topics in greater depth: Surfaces, Channels, I/O, and Textures, so feel free to skip around in a technologically enhanced fashion or to read along in the time honored "beginning to end" fashion. The Surface comes in two varieties: an 8 bit unsigned integer and 32 bit floating point high dynamic range version. This means each of the color components - red, green, blue and sometimes alpha - are represented using either an 8 bit uint8_t or a 32 bit float. These two types are Surface8u and Surface32f, respectively. The majority of the time a Surface8u is just what you need. However if you're doing some advanced image processing, or you want to make use of high dynamic range images, Surface32f is your best bet. Also it's worth noting Surface is just a convenient synonym for Surface8u - you can use either name for the class in your code. Surface mySurface( 640, 480, true ); // width, height, alpha? Here we've asked that the color channels of a pixel be ordered in memory as red-green-blue-alpha. This last parameter is optional (notice that we left it out earlier) and it defaults to something reasonable based on whether you have an alpha channel or not. If we had passed something different like SurfaceChannelOrder::BGRA our pixels would be represented in blue-green-red-alpha order in memory instead. Why would we ever want that? Well many graphics APIs - such as Apple's Quartz, Microsoft's GDI+, Cairo, or OpenCV prefer or even require that pixels be ordered in a manner other than RGBA. This feature is part of what allows Cinder Surfaces to seamlessly interoperate with these and other APIs. In the image below, the small area outlined by the white box is blown up on the right hand side to show the red, green and blue values, as well as the alpha, which is depicted as a block of white to indicate that the pixel is 100% opaque (a value of 255). ... and stores it in memory as an array of numbers (in this case, bytes). The idea to take away is that the Surface is, at its heart, a block of raw data that is interpreted as a rectangular array of pixels. When you're creating or working with images, you're simply moving numbers around and the Surface is really a collection of methods to help you work with that data more easily. For advanced users, if you're familiar with C++ templates then you'll recognize what you see when you open up the Surface.h file - the core type is a class SurfaceT, templated on uint8_t or float. However understanding the implementation is definitely not necessary to understand how to use it. Also, as a side note, Cinder supports a 3rd less common Surface type named Surface16u, but not all of Cinder's image manipulation code supports it - it's there primarily as an intermediate representation (handy for things like the depth information of the Microsoft Kinect). This gives us a very different result. While clone() allocated a new block of memory and then duplicated the pixels of oldSurface, the assigment statement above causes newSurface to point to the exact same pixels in memory that oldSurface does. Without delving too deep into the topic, this feature is what makes it safe and fast for you to do things like return a Surface as the result of a function, or to create an STL vector<Surface>, for example. In the example above, oldSurface and newSurface are able to safely sort out memory managment between themselves automatically. So if oldSurface goes away, it won't take the image data that newSurface is now pointing to with it. However if both oldSurface and newSurface go away, the memory they were sharing is freed for you automatically. Last one out turns off the lights. You'll find this design technique used throughout Cinder. If you're into the Design Pattern literature, you might know this techique as the handle-body idiom. Or if you are familiar with shared_ptr or other reference-counted pointers, you can think of Surface, gl::Texture and many other classes in Cinder as transparent shared_ptr's. That second parameter is an Area, Cinder's class for representing discrete rectangles, and it specifies the region to copy the pixels from. both of which are discussed in greater detail in the I/O section. These methods are appropriate when you're copying big blocks of data. But what if you want to manipulate a single pixel, or even more surgically, a single channel value within a pixel? Here we construct an instance of a helpful class, Surface::Iter, which is used to iterate the pixels of an Area of a Surface. It is designed to be used in a nested while-loop; the outer loop makes use of the Iter's line() routine, while the inner loop uses the pixel() routine. By using these loops, we can access the red, green, blue and alpha values of each pixel in succession. 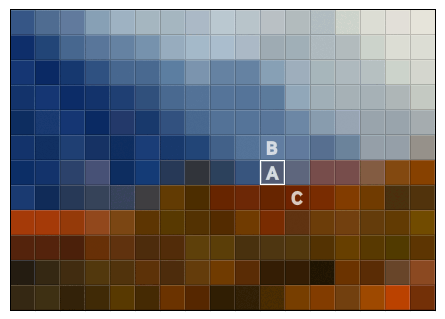 Another thing you might want to do is manipulate those pixels using the values of other pixels in the bitmap. The iterator helps you with a little syntactic sugar to allow you to access the pixels around the pixel that you're currently iterating over. The same way that you can access the red, green, blue or alpha value of the pixel that you want to set using r(), g(), b(), or ci(), you can also get the pixel values with a relative x and y offset using overloaded versions of those same methods. For instance, in the image below, if the Iter is currently pointing at the pixel labeled A in the image, then r(0,-1) will access the red value of the pixel labeled B, and r(1,1), will access the red value of the pixel labeled C in the image. Without getting into too much detail, the algorithm converts the coordinates of each pixel into polar coordinates, adds a value to the angle based on how far it is from the center, and then converts this back to rectangular coordinates. One thing to note in that code is the use of rClamped() and friends. Unlike the normal versions, the clamped variants of these accessors are safe to use when you might be illegally accessing pixels that don't exist in the bitmap. For example, trying to access the pixel to the left of a row's left-most pixel would be illegal normally, but rClamped() will return the red value of the left-most pixel, clamping the x & y coordinates to the boundaries of the image. You may have noticed that channels in a bitmap get special attention, so much so that they have their own class to help you work with them more easily. Let's look at the Channel class itself. In this case a high quality grayscale interpretation is automatically made of your RGB data. We say "high quality" because the red, green and blue are weighted to mimick the way your eye perceives luminance (derived from the Rec. 709 high definition video spec, for those interested in such things). Using a Channel instead of a Surface can also be a smart move when you simply need a lightweight grayscale image, to work with the face detection of OpenCV for example. This saves on both memory and processing time. As a side note, this could be optimized substantially, so don't take the above code to be an example of fast image manipulation. In summary, the Channel is a lightweight tool for working with a particular color channel from a Surface, or as a standalone grayscale image. Copying, image processing operations, or other time critical operations that don't require all the data from a bitmap are best done with the Channel. OpenGL can store textures in a special grayscale-only mode which saves valuable GPU memory. The ImageSource which comes back from loadImage() can tell the constructor of gl::Texture the things it needs to know to allocate such a representation, and it does so automatically. As we've seen, the gl::Texture represents an image on your graphics card. The class features all the things that you would expect of an OpenGL texture: an ID (sometimes called a name in the OpenGL docs), functions to bind() and unbind(), an update() method to load new data into the Texture, methods to initialize the texture, etc. There are a few conceptual things to keep in mind when working with a Texture. Fundamentally it's just a bitmap object, but your program has handed it off to another piece of hardware, the GPU, which has its own memory and processors. Copying from CPU to GPU (by for example, constructing a gl::Texture from a Surface) is much slower than say, copying from one Surface to another, so you should do this judiciously. However once the image data is on the GPU it's ready for any sort of use with OpenGL. The actual data of a gl::Texture is stored on the GPU very similarly to the way a Surface stores its bitmap data in memory. You'll recall that the Surface provides an iterator that can be used to walk the bitmap data and access the pixel data or channel data at any point. Doing the same in the gl::Texture is a different matter. As you are likely familiar, modern GPUs implement a fairly rigid multi-stage process known as the "graphics pipeline" (discussed in Wikipedia here). If you want to access the pixels of a texture there are a few different techniques that you can use, all of which are a little beyond the scope of this article. The most common and recommendation-worthy would be in a Fragment Shader, which are implemented in Cinder using the gl::GlslProg class. Of course if you just draw this, your program won't crash, but you'll just see junk data - whatever random memory happens to be on the graphics card at the moment. Cool if you're making glitch art, not if you're not. Notice the edges on the left. As the English say: that's not cricket. We want smoothed edges as the gl::Texture itself is scaled down. This is where mipmapping comes in: the GPU can generate multiple copies of Texture data when you create it and that data can be swapped in and out when needed for minification or magnification in your application. A mipmap is a miniaturized version of the larger bitmap that helps you reduce artifacts when scaling. The smaller the texture is drawn, the smaller the mipmap that the GPU will select. 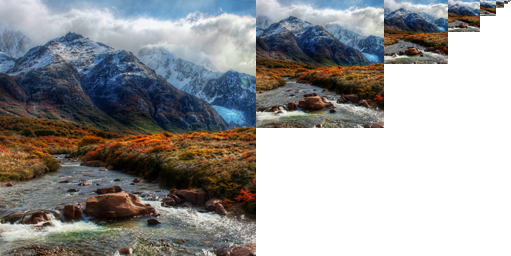 As an example: a texture has a basic size of 256 by 256 pixels, so a mipmap set will be generated with a series of 8 images, each one-fourth the total area of the previous one: 128x128 pixels, 64x64, 32x32, 16x16, 8x8, 4x4, 2x2, 1x1 (a single pixel). Artifacts are reduced since the mipmap images are effectively already anti-aliased, taking some of the burden off the real-time renderer and potentially improving performance. You'll notice we added a call to setMinFilter() to tell it use our mipmap. In general Cinder is designed for you to use the OpenGL constants directly (like GL_LINEAR_MIPMAP_LINEAR) so if these are unfamiliar to you, we'd recommend you pick up a book like The OpenGL Programming Guide. And that's that. As promised: image data from the filesystem, to the CPU, to the graphics card, and finally to your screen. Now go make something and have fun. And thanks to Flickr user Trey Ratcliff, whose beautiful photograph is used throughout this tutorial.